Lynnette Culver is currently the subject of a Pocatello, Idaho cold case investigation. It is believed that Lynnette was abducted and killed by notorious serial killer, Ted Bundy, as he confessed to her murder two days prior to his own execution on January 24,1989. 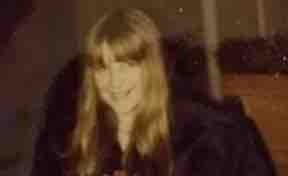 At the painfully young age of 12, Lynnette went missing in May of 1975. Although a police and volunteer search was conducted, and many years later Ted Bundy stated her body was left in a nearby river, fitting the description of the Snake River, her body was never found. Currently Lynnette has no grave site nor a memorial honoring her memory. The purpose of this crowd funding is to obtain enough money to build a public bench made of marble, engraved with her name, date of birth, date gone missing, and a couple of her drawings. The family would like to have it installed either on the grounds of the middle school from where she went missing, or placed in a nearby public park where she played. Please help us give Lynnette’s family and community a place where they can spend some time honoring her memory, and that is dedicated to this young girl who was taken from us far too soon. All proceeds will be transferred to a trust fund set up in Lynnette’s name by Crystal Douglas with Idaho Cold Case Files. 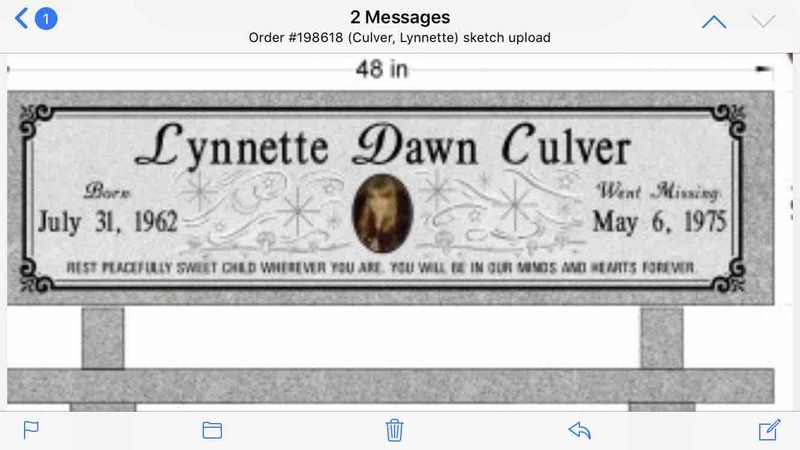 All construction, engraving, placement and installation will be overseen by the family of Lynnette Culver. Any unused funds will go to the charity of the Culver’s choosing. Everything is now a go! We only have $555 left to raise!. Thank all of those who have already contributed! Thanks to you, this will be a reality! 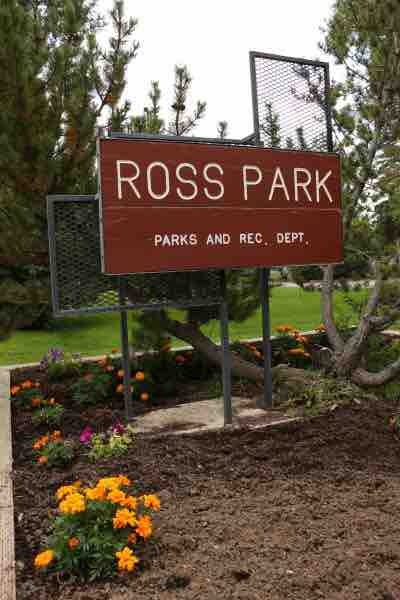 The memorial has all the approvals to be placed at the beautiful Ross Park in Pocatello. At the family’s request, the reveal will be July 31st this summer which is Lynette’s birthday. As the date grows closer, we will have more details to let those of you who have contributed know in case you’d like to attend. Again, thank you so much! We couldn’t have made this happen without all of your support! Thank you! Due to personal reasons, Lynnette’s family won’t be able to be present for the original reveal date. They have decided to reveal the installed bench on Lynnette’s birthday, July 31st of this year. In case you were planning on being there, we wanted to let you know as soon as possible. As usual, we’ll keep you updated on any changes there may be. Again, thanks to all who have contributed. The outpouring of support and love is inspiring! Several people have come together and have decided it’s time that they shine some light on Lynnette Culver, rather than Ted Bundy. She hopes the bench will not only serve as a memorial, but also bring awareness to her sister’s case and help prevent similar tragedies from occurring in the future. Organizers have the completed design and are just awaiting approval from the Arts Council and the park in which it will be placed. “We’re hoping installment will be in May. The bench order must go in roughly eight weeks before installation,” says Crystal Douglas of The Idaho Cold Case Files. Organizers and the family hope they will be able to raise enough to complete the memorial. They want to give the Culver family and friends a place to go and remember their loved one. Before his death in 1989, Bundy confessed to Lynnette’s murder and revealed to former Idaho Attorney General Jim Jones personal details about her life that only she would know. But some believe he might have done so to delay his execution. Police announced last August that they are going to take another look at her case along with those of other Pocatello girls who were abducted and killed in the 1970s and 1980s and search for any commonalities. Still, her sister, Nancy Albano says her family has resigned themselves to the idea that Bundy did what he said he did. They’ve never personally listened to his interview tapes — they didn’t want any of those images placed in their minds — but they know some of the dates and details he mentioned matched up. Albano says her family doesn’t think Lynnette is still alive, but they would love to find her and have that closure. Albano says her family has gone through a lot since her sister disappeared. Their dad flew all over the U.S., heading out every time someone thought they spotted his daughter. Their mother’s beautiful brown hair soon turned white after Lynnette’s disappearance, Albano said, adding that the stress took its toll. And their grandfather often went to Alameda Junior High School searching for Lynnette. Albano said she doesn’t have her sister anymore and her children don’t have their aunt. Hoping to bring the Culvers at least some peace, organizers are asking people to contribute whatever they can to building a memorial bench for their daughter and sister. “Even if it’s a little bit, you’d be helping a current and former Pocatello family reach their goal of a memorial place for their daughter and little sister,” she said. Douglas also hopes people will come forward with any information they may have about Lynnette’s disappearance. 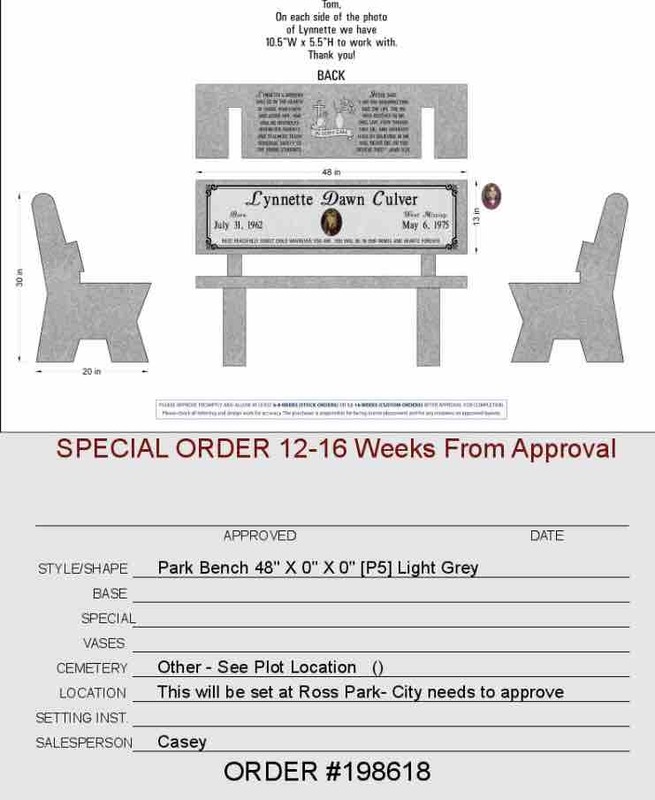 The Lynnette Culver Memorial Bench has reached 55% of its goal. Thanks to Robert, Carol and Arlin & Lu and so many others!